In additions to dozens of free integrations and plug-ins, our Newsletter API makes it easy to integrate your online platform (E-commerce, CRM, CMS, Analytics) with our newsletter software. 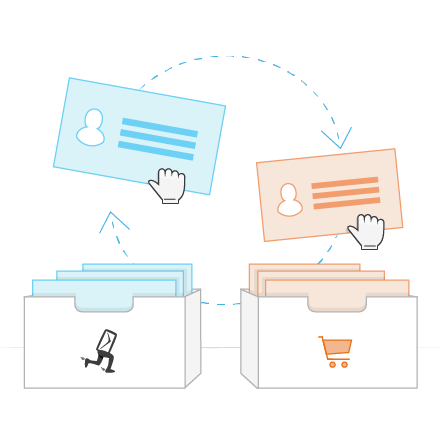 This enables you to synchronize contact data as well as transfer product information directly from your e-commerce system into your Newsletter2Go account. Use the API to send purchase confirmations, follow-up notifications, shopping cart reminders and follow-ups, and other behavior-based email notifications. The API allows notifications to be sent in real time, meaning that you can speak to your customers at exactly the right time with exactly the right message. With the Newsletter2Go REST-API it is possible to use our high-performance newsletter sending infrastructure and to connect it with your own web services however you like. This means that you can use our newsletter software exactly the way you want to. Our Newsletter API is simple, powerful, and is documented thoroughly and updated continuously. The latest features are always available to you. Furthermore, we make the integration process easy for you with our example implementation. Use our detailed example implementation and documentation to send your emails with Newsletter2Go’s high-performance sending architecture. If you have any questions, please do not hesitate to contact our support team for free. Aside from the integration solutions for e-commerce platforms and REST-API, Newsletter2Go also offers the option of integrating tracking software from third-parties such as Google Analytics and econda. In addition to Newsletter2Go’s tracking system you can also connect your own tracking system in a flash. Is the system that you use not supported? Then don’t hesitate to tell us. This will enable us to take your needs into consideration when developing our product. We’re always developing new features and integrations, and would love to work with you to develop a solution that is perfect for you and your firm.